I'm writing to share something I wouldn't have believed possible before I attended Emily's workshop in Marblehead last December (2005)-- but ever since then I've been determined and confident this would happen. Last night, a bit after midnight but before I went to sleep, I finished my first novel! 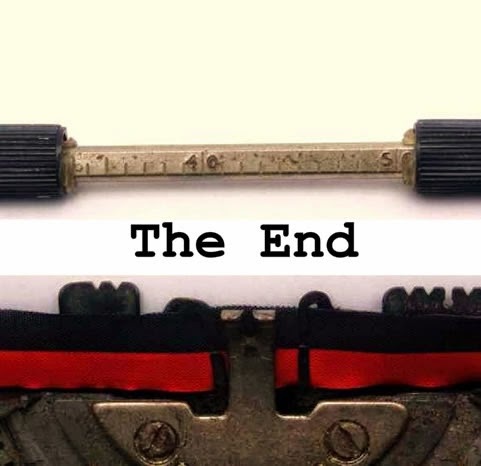 After nearly 140,000 words and never ending stops and starts, it's hard to believe the two simple words "The End" could be so meaningful and profound to me. All day long today I've thought I was feeling a bit hung over from one too many martinis, but I think it's every bit as much of an emotional hangover. Jason tells me it's just post-partum depression, and that feels right to me! Being a good Virgo, I of course want to do a read-through to make sure I didn't leave any huge errors, and to adjust things that I figured out at the end, but as soon as that's done, Emily and I are going to dig in. I've even gotten over my nerves about that and realized every time I or someone else goes through it, the story will get sharper and tighter, and the characters will get stronger. I cannot wait to get started! I'm also eager to get started on the second book and see what's next. This story has been with me for over a decade. I've thought it was dead more times than I care to count! But these characters, one in particular, have refused to let me forget about them, the story they wanted to share with me, and the journey they wanted to take with me. So if you've got a character like that, or even if you don't have the character or story (or a different dream) yet but know you will, believe within yourself that it WILL happen.